Come to a fun GIRL’S NIGHT OUT! Our skin care therapists at Candessa Aesthetics will educate and demonstrate on Facials, Tinting, Waxing, and Microdermabrasion. Event should last no longer than 45 minutes to an hour! If you’ve always wanted to know more about these treatments, this is the perfect opportunity for you!!! 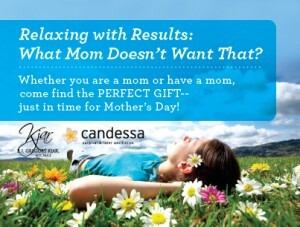 We’ll have fun ideas for Mother’s Day gifts along with great deals on facial & microdermabrasion packages. Packages and promotions only available to those that attend the event!